SPRINGFIELD—MGM Resorts International’s charm offensive has entered its next phase as its whittled down casino project faces scrutiny from city and Massachusetts gaming officials. Some local officials, like Mayor Domenic Sarno, mouth both robust scrutiny and sticky-sweet support for the project. Yet, MGM could encounter a more difficult time before councilors who campaigned on holding the company accountable and gaming commissioners who may not want to appear to be rubber-stamping changes. In September, MGM announced it was deleting its 25-story hotel tower in favor of a 6-story structure facing Main Street. Then environmental filings disclosed the project’s size was shrinking 14%, prompting city councilors to demand answers and MGM executives to fly to Springfield for an audience with Sarno. While Sarno and other major MGM backers, such as organized labor, have all but accepted MGM’s apologies and explanations, the Council has yet to render its judgment. It will begin to do so this month as it reviews MGM’s site plan, zoning requests and changes to the host community agreement. None of this means MGM will not win its approvals. Gaming commissioners will face pressure to accept the changes. They did not contest MGM’s assertion that the new design fulfills its programmatic, if not physical promises. Despite rampant Council skepticism MGM can probably get the seven votes most items will need to pass (one requires nine votes, but that, a zone change, seems likely to coast). Still, the Gaming Commission has taken a slightly harder line in tone. Before Thursday’s meeting here, Gaming Commission Chair Stephen Crosby implied MGM had yet to explain why its project’s cost would be rising about 25%, while the project size had fallen 10% (MGM has said the 14% figure in filings overestimated the shrinkage). Crosby maintained that incredulity Thursday—echoed by Commissioner Enrique Zuniga—after MGM explained the project cost rose from $800 million to $950 million, despite saving $50-75 million without the tower. MGM offered some details on why its budget had spiked. Officials said materials and labor will cost more than expected, complicated by the longer construction timeline—MGM Springfield is slated to open in 2018, two years later than first proposed. MGM also cited rocketing pre-opening costs. That did not satisfy commissioners, who while pleased with MGM’s update over all, were surprised company officials were not armed with more data. Commissioners press for more explanations of why project costs are up by 25 percent while casino size is being shrunk 10 percent. “I was expecting a little more detail to come from you in the area of cost,” Zuniga told MGM officials. Nevertheless the presumption that the commission will go along is probably right. The only wrinkle may be the City Council. A split vote on the body could prompt the gaming commission to scrutinize MGM further. With voters unlikely to have any direct say and Sarno’s pushing this legacy-defining project, the makeup of the Council’s vote could be the commission’s best sense of the public mood in Springfield. 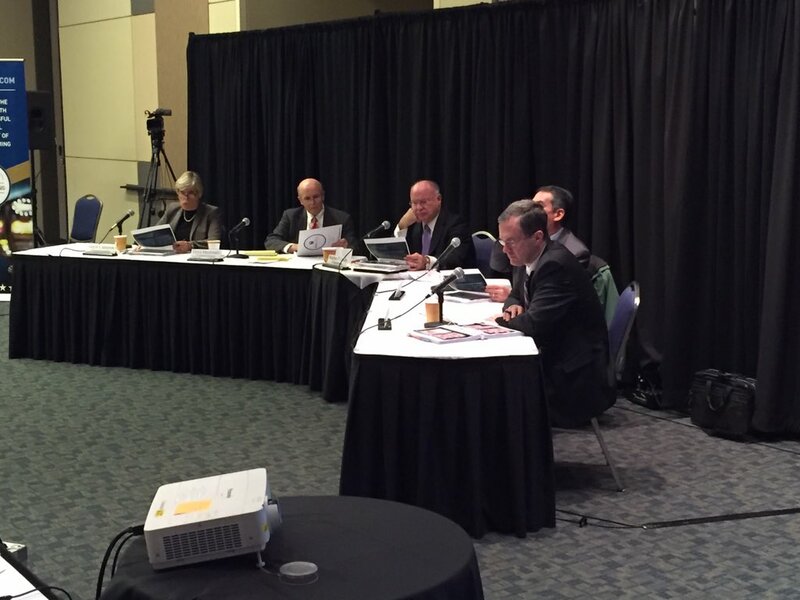 The gaming commission’s comment period after MGM’s presentation Thursday featured three councilors with differing views. All expressed support for the project generally, but only at-large Councilor Timothy Rooke offered almost unconditional support. He plugged the mayor’s talking points, mixing in defenses of the changes and rhetorical valium about baseball—which remains fantasy baseball unless and until Hartford’s team consents—and a riverside aquarium. By comparison, Council President Michael Fenton said the city must get something in exchange for accepting the changes, as well as concrete assurance other benchmarks can be met. Ward 8 Councilor Orlando Ramos argued the project’s economic impact would be greater with the tower, however much its absence fits better with Springfield’s scale.
.@MFentonSpfld: "I still support MGM," but, "I also stand before you today opposed to their design changes." Some councilors agree with Rooke, but one of them, Ward 5 Councilor Clodo Concepcion lost reelection last month. Others share Fenton and Ramos’ skepticism. A majority may not be automatic, but it should not be a heavy lift for MGM. Securing a unanimous Council vote, like it did in 2013, could be a Herculean effort, even for the multibillion dollar corporation. Whether the council or the gaming commission, trust may be the most significant issue for MGM. Mathis says hotel tower was "least interesting part of design." Didn't make that statement when tower was originally pitched. While less of an icon than the six-story hotel will be, there is a case for the shorter design. But why did they not just propose that in the beginning? MGM CEO Jim Murren’s explanation that it was about developing luxury suites had a point, but was caked in gibberish. It seems that MGM’s biggest problem—other than Connecticut—is not insufficient financial capital to meet soaring costs, but profligate use of political capital that, until recently, had limited its most vociferous critics to the backwaters of the Internet.